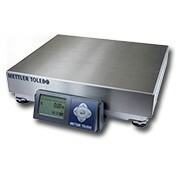 The Mettler Toledo BC-6L scale is the ideal parcel and letter scale. More accurate for small Letters than BC-60. Ideal for stores that do a lot of USPS Mail. Capacity 150 lb x 0.1 oz/0.2 oz/0.5 oz., 12 x 14 in., USB interface, Stainless Steel Platter. Legal for Trade.